This photograph shows student activists putting up a banner on the "500" building, marking the beginning of the takeover whose aim was to claim the building, hold classes, provide childcare as well as providing services to the students who had occupied the building. In both English and Spanish the banner states that the building belongs to Hostos Community College. To draw attention to their cause and to demand needed funding to complete renovations to the building, students and faculty occupied the property to pressure Mayor Koch and other officials to enable bond sales and renovations to proceed. 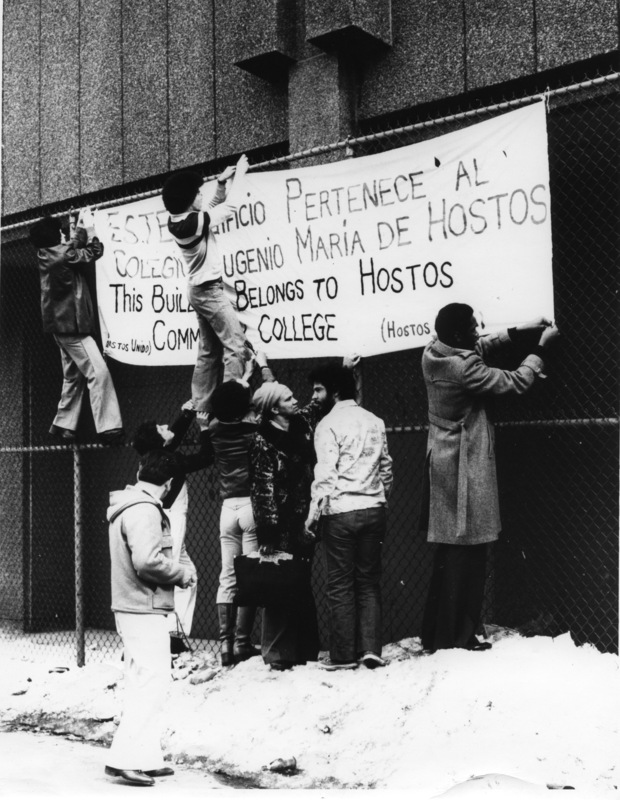 This late 1970s action was a part of the third campaign to save Hostos Community College. Having extremely poor facilities, the college had acquired a second building across the street from its original location that would allow Hostos to expand. However, the 500 Grand Concourse building needed to be repurposed to be useable but the college had been denied the funds necessary to prepare and utilize the 500 building for educational use. A fresh wave of organizing by students and faculty drove efforts to enable Hostos to continue to be a hub of opportunity for residents of the South Bronx. Cite This document | “Students and Faculty Take Over the 500 Building,” CUNY Digital History Archive, accessed April 24, 2019, http://cdha.cuny.edu/items/show/6212.